A recently released copy of the Federal Bureau of Investigation file for Central Intelligence Agency Director Admiral Roscoe Hillenkoetter reveals that shortly after his retirement, Hillenkoetter admitted to FBI Director J. Edgar Hoover that elements of the Agency were corrupt. 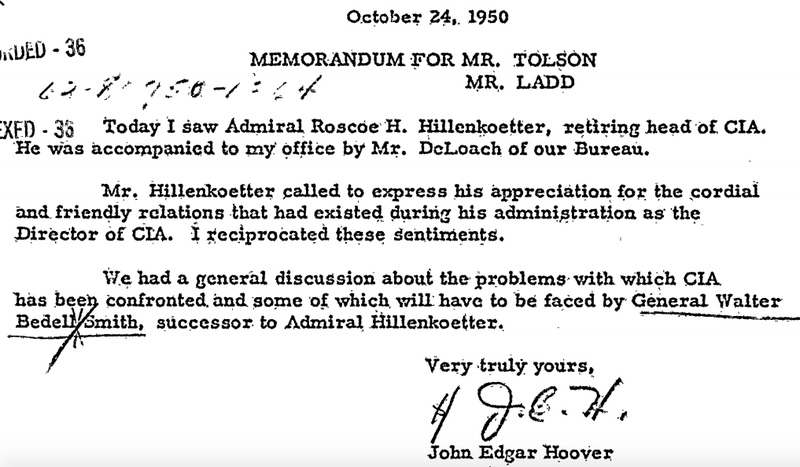 The relationship between Hillenkoetter and Hoover appears to have long been cordial and forthright, with the CIA Director repeatedly praising the Bureau and Hoover returning the compliment. Following Hillenkoetter’s retirement from the CIA in order to return to the Navy, he kept in contact with the Bureau, acting as both an informant and liaison, and at times using his position to expedite matters for the Bureau. 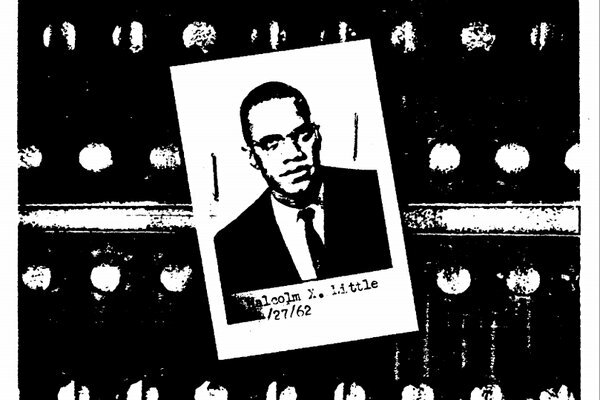 One of the most historically significant moments shared between the FBI and Hillenkoetter came from shortly after his retirement, when he described the “blunder and corruption of OSS and certain elements of CIA” in a private meeting with Hoover, according to memos obtained by MuckRock. At 10:15 am on the 24th, Hillenkoetter had his meeting with Hoover. According to a four sentence memo written by Hoover, Hillenkoetter came to thank Hoover for his cooperation with the Agency, a sentiment which Hoover returned in kind. Without going into detail, Hoover said they also had a “general discussion about the problems” that General Walter Bedell Smith, the incoming Director of Central Intelligence, would have to face at the CIA. A memo written to the Director the following day reveals more about the meeting. After leaving the Director’s office, Hillenkoetter spoke confidentially with Cartha “Deke” DeLoach, the FBI agent who had escorted him to see Hoover. 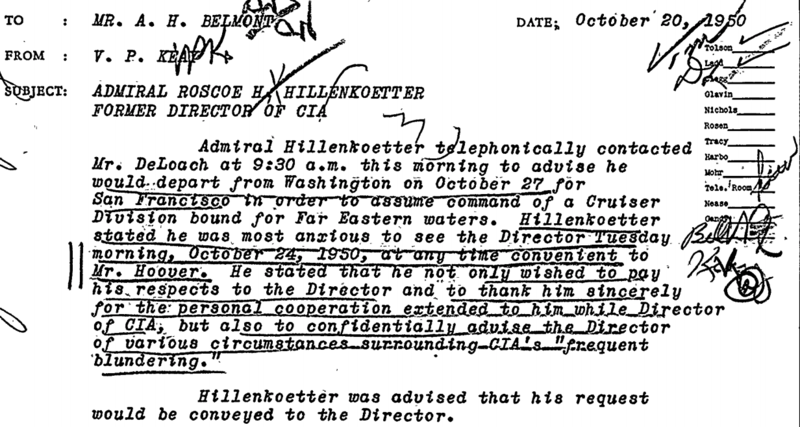 According to the memo, Hillenkoetter said that he had spoken with Admiral Sidney Souers about William Jackson, the Deputy Director of CIA, who Hillenkoetter considered unfit for the position. Admiral Hillenkoetter was the first CIA Director, Souers had been the first to hold the title of DCI during the earliest days of the Central Intelligence Group, CIA’s direct predecessor. Following his departure from CIG, Souers joined the National Security Council, a post he held until 1950 when he retired from public service. Even after his retirement, however, he remained a confidant and advisor for President Dwight Eisenhower. Hillenkoetter felt that Souers would use this relationship to “attempt to do something about replacing Jackson,” referring to a feud MuckRock has previously touched upon. The memo added that the Hillenkoetter expressed relief at discovering that Hoover “fully ‘knew the score’ about the blundering and corruption” of the Office of Strategic Service, the World War II predecessor to CIG and CIA, and of “certain elements of CIA,” using similar language to what the previous memo, written by a different FBI official, had used when quoting Hillenkoetter. It’s not immediately clear what elements of the Agency Hillenkoetter was referring to, or what he meant by corruption. While provocative, the term is vague and it’s unclear whether it referred to ordinary corruption or corruption caused by Soviet agents, which his successor, Smith, felt with “moral certainty” had compromised the Agency. 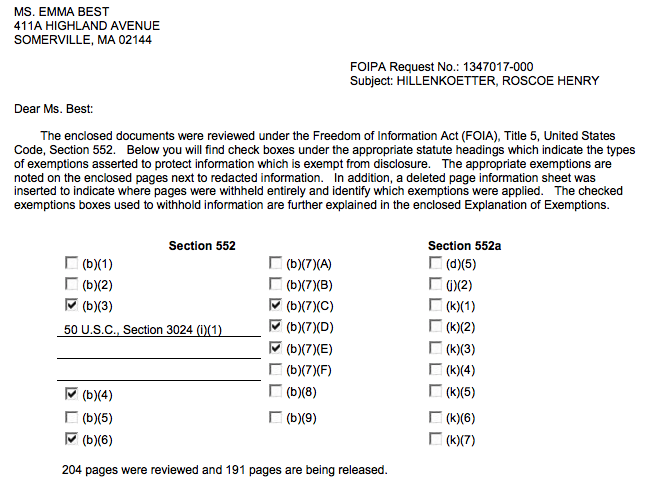 Requests for additional information about the meeting have been filed with FBI and CIA, along with referenced file numbers. In the meantime, you can read Hillenkoetter’s comments to Hoover embedded below, and the rest on the request page.